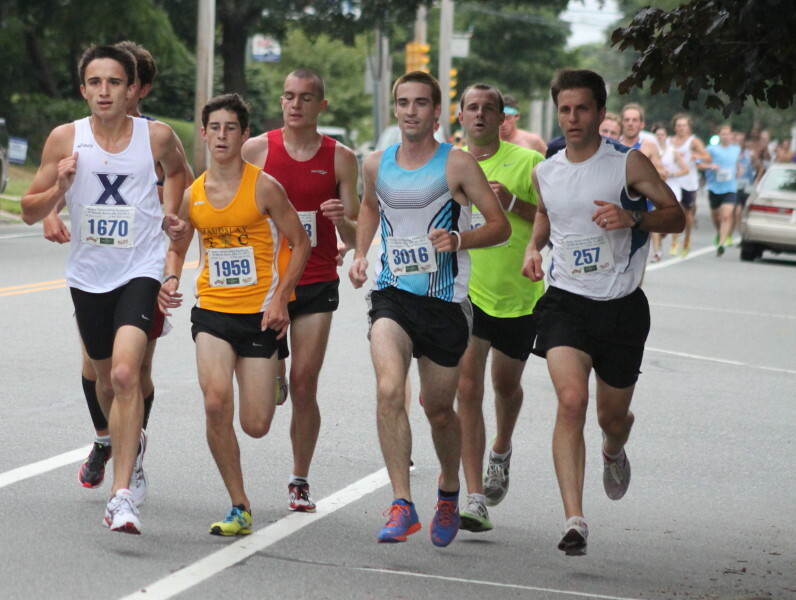 Dan Hocking, Dereje Hailegioruis, and Andrew Huebner are all in view as the finish nears in the 10-mile Yankee Homecoming race. (Newburyport) You want close? 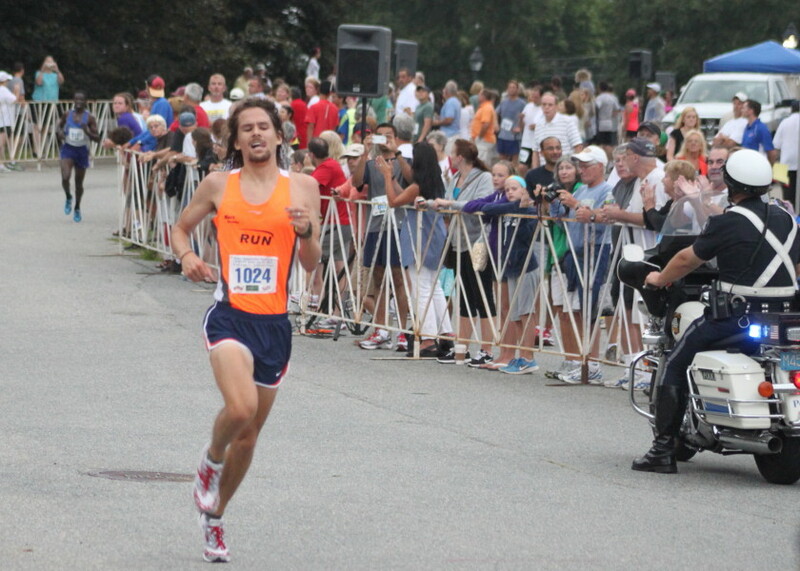 You sure got it in the 52nd Annual Yankee Homecoming ten-miler on Tuesday night in Newburyport. 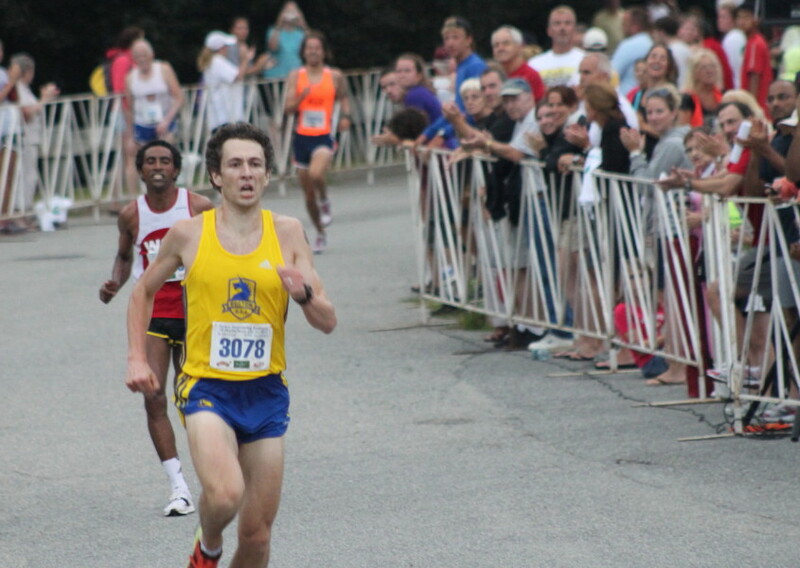 The top four finishers, led by race winner Dan Hocking, were a mere thirteen seconds apart! Any summer road race faces the possibility of too much heat but on this night the temperatures were close to 70 degrees and there was a light drizzle after the race. One thing that never seems to fail is that one mile into the race the leaders at the end are well positioned in the front. And that was the case (again) as I noticed when I reviewed the pictures I took of the front pack at the one-mile mark in front of the Cushing Museum on High Street. Granted there were several wannabe’s in the front pack but the eventual winner (Dan Hocking), second place (Dereje Hailegioruis), third place (Andrew Huebner), and fourth place ( Moninda Marube) were all in the mix. Dan Hocking ran for UNH and recently received his PH.D in Ecology. 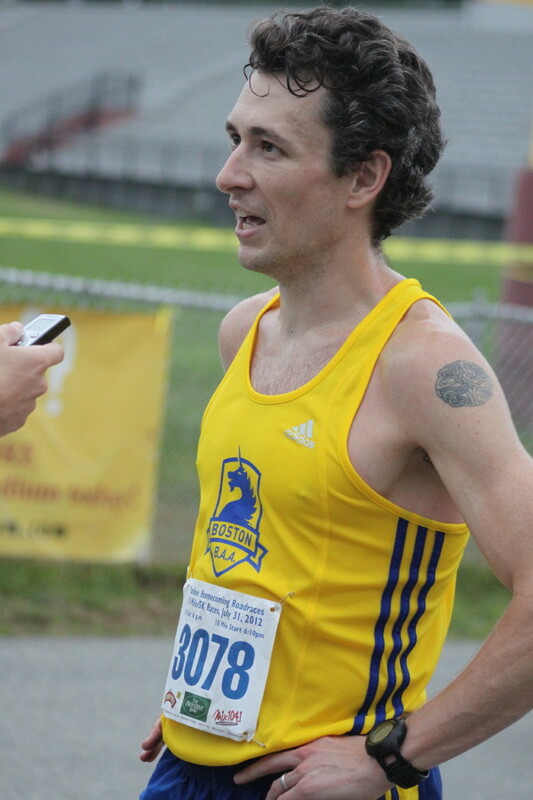 He is a coach with Northeast Running Services. Dereje Hailegioruis is from Ethiopia now living in New York City. He has won a number of races in New York. 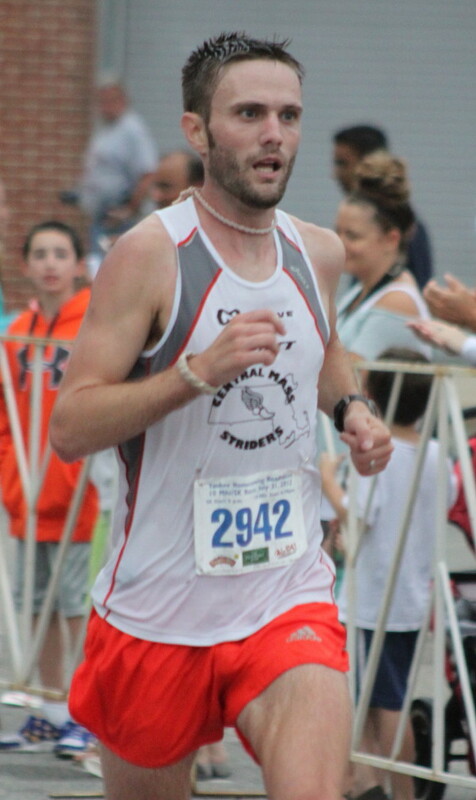 Andrew Huebner graduated from Governors’ Academy and Bucknell and ran track at both places. Moninda Marube (3101) congratulates Dereje afterwards. Moninda was not even listed by the Cool Running race results site even as late as this morning. 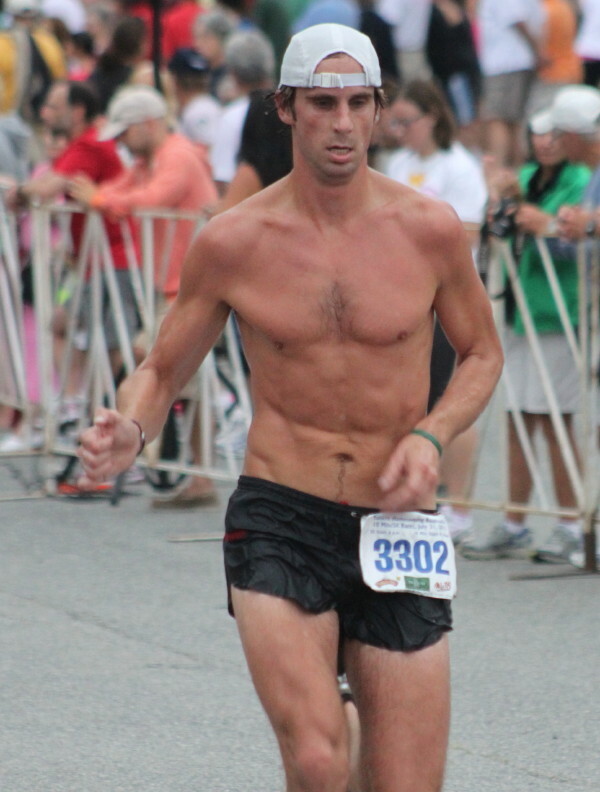 I checked my pictures and thought that maybe he had taken a “shortcut” to the finish – remember Rosie Ruiz?? 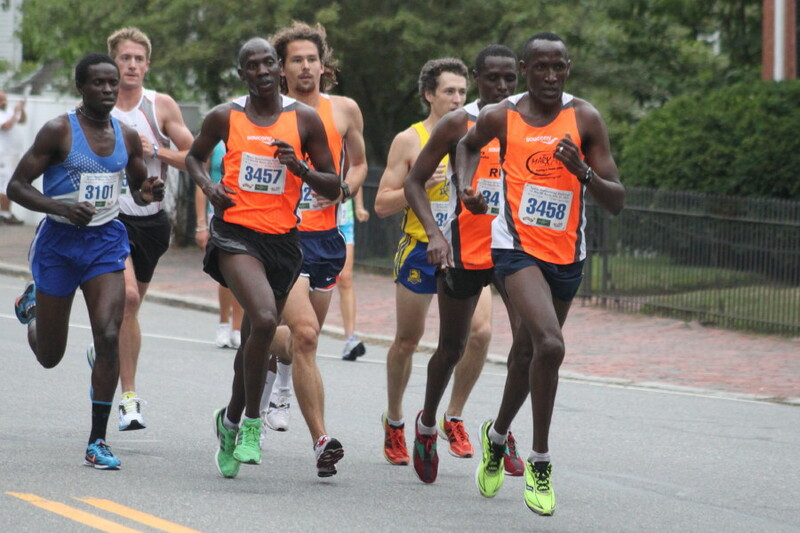 However, Marube was in the front pack at one mile so I then suspected that the race electronics hadn’t picked him up. Anyhow, he is now listed as getting fourth in Cool Running and rightly so. 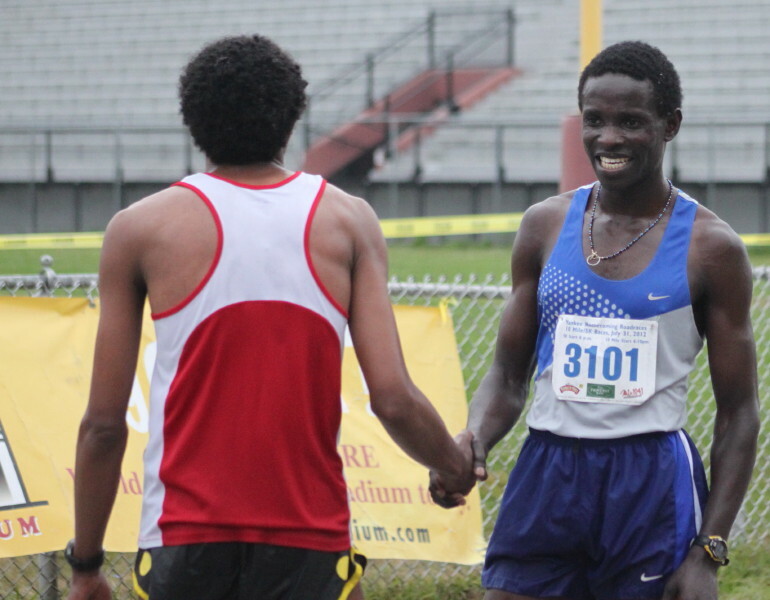 Monida Marube, from Kenya, won the Old Sandwich Road Race in Plymouth (MA) on June 3rd and came away with a winner-take-all $3000. 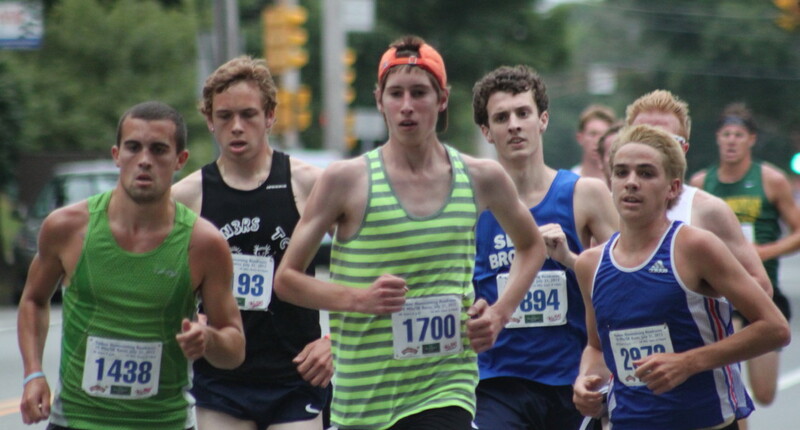 I also saw the 5K at the one-mile mark and again the eventual top four: winner Eric McDonald, 2nd Ben Pare, 3rd Brendan Robertson, and 4th Connor Habib were all there. 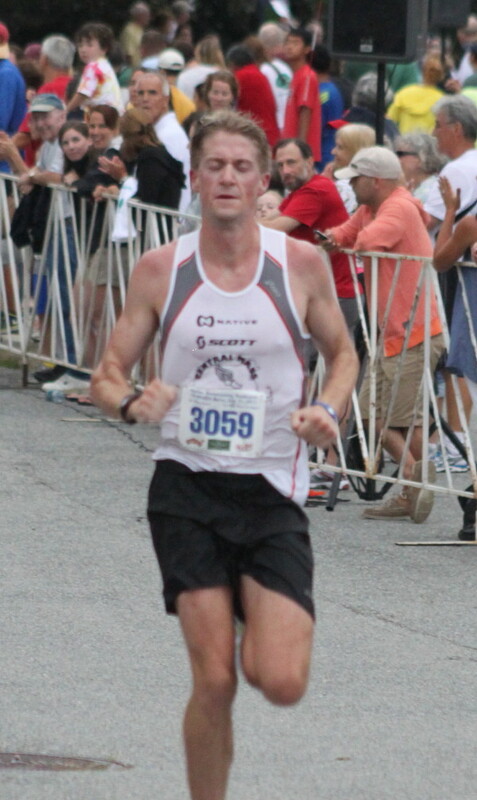 I check my pictures of the 5K afterwards and noticed that a 37-year-old named Brett Budzinski had finished 13th. Yes, this was the same Brett Budzinski who had been a three-sport standout for Ipswich High School back in the day! 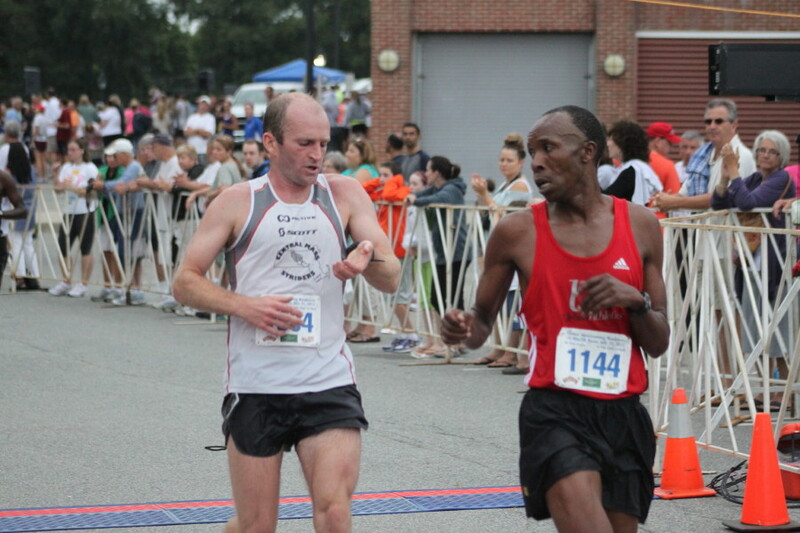 This link will give you the official results from the Yankee Homecoming races. Winner Eric McDonald (1438), second place Ben Pare (1700), third place Brendan Robertson (1894), and fourth place Connor Habib (2972) are in the front group in the 5K after one mile. Matt Orlando 1670, Joe Santo 1959, Conor Westwater 3016, and Brett Budzinski 257 one mile into the 5K race. 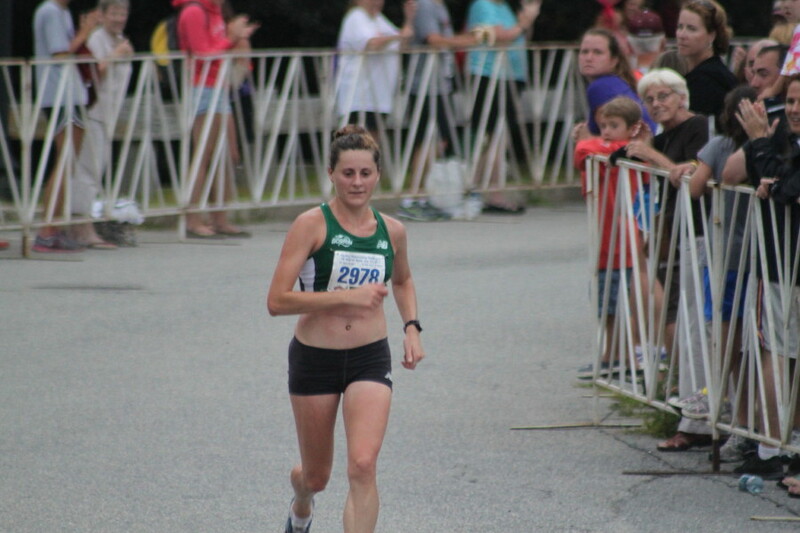 Katie Dicamillo from Rhode Island was the first woman in the 10 mile race. Top four finishers are in the front pack although Dereje is hidden from view.